There is no question in my mind that running can be an up-and-down thing. And I’m not just talking about the hills. We are nine weeks into training for the Dumbo Double Dare in California. The training schedule is pretty reasonable. Most weeks involve two 45-minute runs through the week, then a longer run on the weekend. At this point in the training, we run back to back runs every other weekend to prepare us to run the back to back 10K and Half. This weekend, I happened to be in Atlanta for a conference. So I ran my 45-minute run on Friday, then my 6K early on Sunday morning, with plans to run 15K with Barb on Monday night. We chose the evening to avoid the worst of the heat and humidity. I proceeded to have one of my Worst. Runs. Ever. But sometimes that happens. I had been dreading that run, hadn’t hydrated properly, hadn’t slept much (flight delays from Atlanta), etc. When I finished (after bathroom stops and walking almost all the last 2K), my calves started seizing in the shower, I had a fever, and my stomach was a complete mess. I downed a bottle of PowerAde and went to bed. I slept for 7 hours straight (which is not normal for me). But I finished the distance. It didn’t kill me. I feel fine today. I’m chalking it up to a perfect storm of a virus, the humidity and dehydration. Bad runs happen. And I don’t have to do it again for two weeks. And my 45 minute run on Wednesday is going to feel like a cake walk. 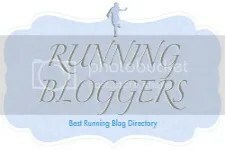 This entry was posted in Uncategorized on June 25, 2013 by RunningFamilyStyle. And There it Was – Gone! On our run yesterday, Barb and I plotted and schemed about how we could sign ourselves up for the Run Disney Glass Slipper Challenge (10K + Half) in February without turning it into a family vacation. We will have just gotten back from the big bad Disney Marathon in January. Besides being fiscally irresponsible, all but one of the kids (in the two families) will be in Junior High, so missing more school is a bit of an issue as well. So we schemed. If Barb signed me up as a birthday present, I couldn’t very well decline, and of course I would need my running partner with me. The two of us could go together, sans family. OK, it was a bit of a pipe dream. Going to Disney without Mark would be impossible, Disneyphile that he is. Our original plan was to run the Princess Half for the first time with Madison, Margaret and Madeline. At least two of them are pretty keen to run a Half as soon as they are old enough, which is 14. So maybe we’ll wait until 2016 to run that one. By that point, Madison and Margaret will be mopping the course with the rest of us. This entry was posted in Races and tagged destination run, family fitness, Glass Slipper Challenge, Half marathon, kids running, Princess Half Marathon, run disney, Running, training on June 12, 2013 by RunningFamilyStyle. Oh No, They’ve Done It Again! So it’s now all I can do to restrain myself from clicking a few keys on this keyboard and registering for that puppy. Alas, if only it were just about the entry fee… Barb might talk me into it yet. Speaking of the Dumbo Double Dare, Barb and I are into the 8th week of our training plan. We ran a 5K and a 13K on the weekend. This weekend it’s 6K and 15K. Wish us luck! This entry was posted in Races and tagged coast to coast medal, destination run, Disneyland, Dumbo Double Dare, family fitness, Glass Slipper Challenge, Half marathon, Running, Walt Disney World on June 11, 2013 by RunningFamilyStyle. We would like to discuss goal-setting in the future, but an impromptu conversation while running with my daughter last week led me to briefly offer my suggestions on this matter. Setting goals is very important in everything we do, but it is very individual. Like most sports, activities or even school, we often find ourselves comparing our performance to others. This can be a recipe for disaster and can quickly deflate our desire to run (or do other activities). I often tell my family to set two personal goals. Your first goal should be easily achievable, but a little out of immediate reach. Your second goal should be a little harder, but with a little training/work, also achievable. Remember though, ALWAYS measure your performance against yourself. 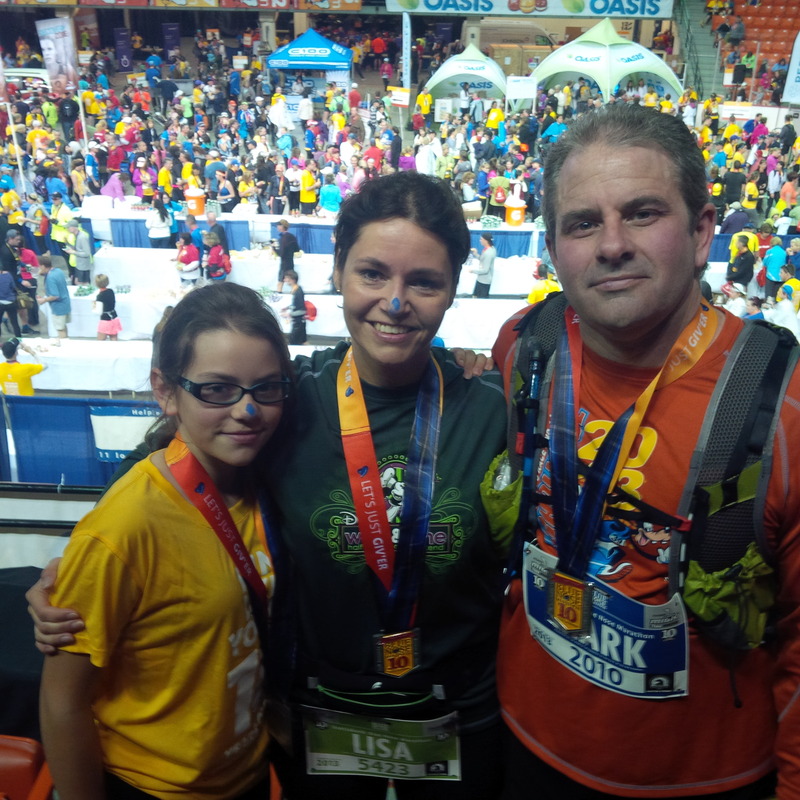 I had the opportunity this past week to run once with both my daughters. The other night Madison and I went out for a run. Madison is still very new to running, but doing extremely well. Like most people she often compares herself to her friends. We had a great conversation as we ran, which by the way often inspires children to run a little farther. We talked about a short and long-term goal that would challenge her, but not discourage her. I reminded her that running should be fun and although you may run with people, it is an individual activity with individual goals and expectations. My frequent running partner and I are fortunate that we run with similar goals for our half marathon races, but he does not run marathons, so I set my own goals for those races. I like to push myself, but I know I’ll never run a 2 hour marathon, so I don’t set that as my goal. I challenge myself so that I can improve and only measure my performance against myself. We are fortunate to live near a large park, with lots of trails that run along the ocean, past old turrets and batteries of a century-old defence fortification. Madison and I had a great run, enjoying the views and the conversation, as we discussed goal-setting. She now has set her own goals for her next 10k, at the end of August. My run with Gabrielle was quite different. The only goals we discuss is where she wants to run and how far. We want the girls to enjoy running and at Gabrielle’s age (8) my wife and I believe this should be her only goals. She is interested in her times when she goes in an event, but with us she just wants to run and talk. We ran a shorter run through the park and even stopped at a high point to look out over the water and all the sail boats. Running with your children gives you a great chance to talk, or should I say listen. 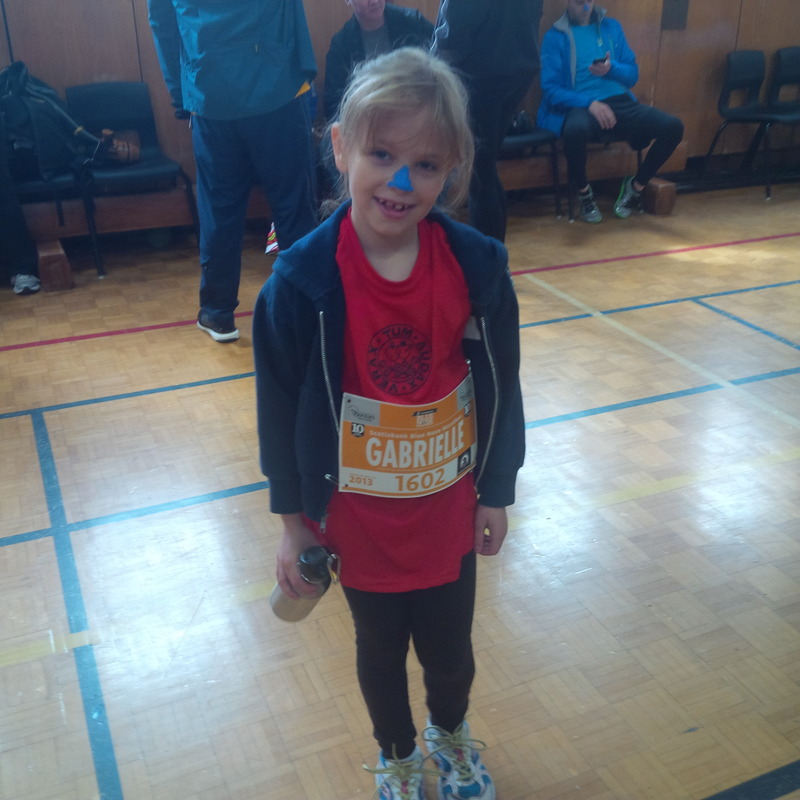 Gabrielle talked about school, dancing, running and music. Before I knew it our 5k run was done. I am proud of my wife and daughters’ progress and I’m happy we can all get outside and run. As I look out the window at the clear sky and warm sunny day I challenge every family to put on your sneakers and head outside. Run around the block, run a kilometer or run longer, but just get out and run. Set a goal for yourself, no matter how small. You’ll be glad you did. This entry was posted in Training and tagged family fitness, goal setting, kids running, long term goal, training on June 7, 2013 by RunningFamilyStyle. My schedule got a little out of control on Tuesday, and Barb and I couldn’t connect for our 45-minute training run. We agreed (promised) that we would run separately. Barb managed to knock her run off early in the day, but I was in and out of meetings, and resigned myself to running in the evening (following a volunteer Board meeting). 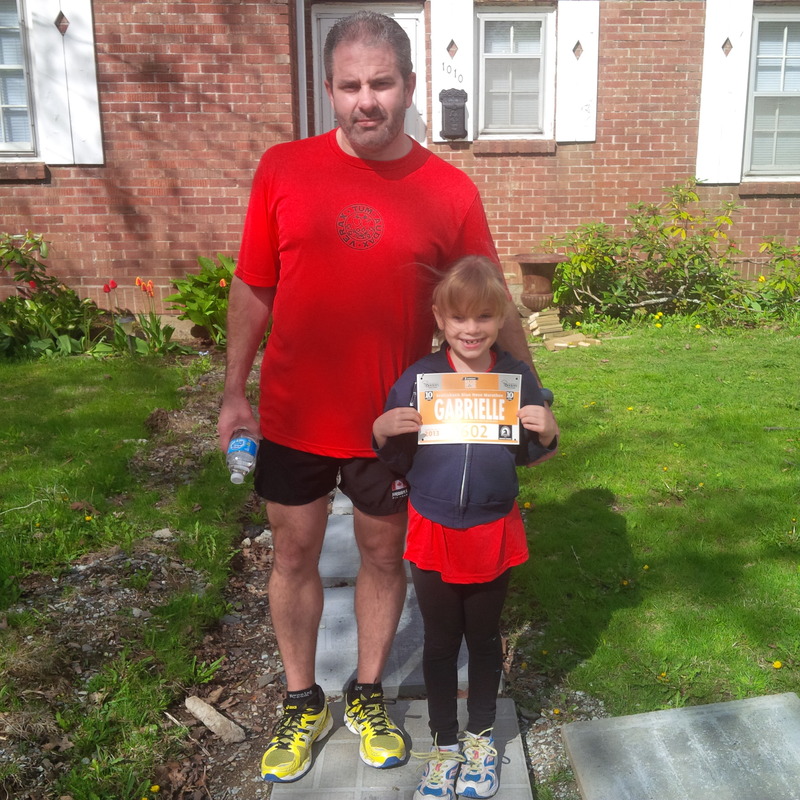 Mark suggested that I run with Madison, and that he would run with Gabrielle, and the whole family could get a run in. That sounded like a great idea. Needless to say, by the time I got home from my meeting at 7:45, I didn’t feel much like running. And despite my promise to Barb that I absolutely, positively was going to do that Tuesday run, I was pretty much ready to call it a day. But when I walked into the house, Madison and Gabrielle were already in running gear, raring to go. I had no choice – no “out”. They were my little motivators. Madi and I had a great run. She was feeling conflicted about having to choose between performing in her school musical and performing in the year end show at Atlantic Cirque. (Thankfully her dance recital is a week earlier – that was a huge issue last year…) So we talked about it. For 45 minutes we ran, and we talked. About her decision. About the impending end of elementary school. About “stuff”. The thing about talking while running is that there’s no eye contact. Madison was able to just talk, without the awkwardness of having to sit across the table, or the living room, and look at me. I really think I’ve just stumbled upon the best way to have a conversation with your pre-teen. So if there are big things happening in your son’s or daughter’s life (or even if all is well) take him/her out for a little run, and find out what’s on his/her mind. I’m glad I did. This entry was posted in Uncategorized and tagged family fitness, kids running, motivation, Running on May 30, 2013 by RunningFamilyStyle. The gang is now in full swing, training for the Disneyland Half Marathon Weekend in California. Six adults (Lisa, Mark, Barb, Dave, Jen & Paul) are training for the inaugural Dumbo Double Dare. We will run a 10K on Saturday, followed by a half marathon on Sunday. That’s a total of 31.1K in two days. (19.3 miles for our friends in the US.) The kids are running as well. Gabi, Jon and Emily will run the 5K Disneyland Family Fun Run; and Madison, Margaret and Madeline will run the Disneyland 10K. Barb and I are just wrapping up week 5 of our training plan. It’s pretty simple, really. We run two 45-minute runs through the week (usually around 6.5K at our current pace), with our “long runs” on weekends. This is a big weekend for us because it marks the first of our “double runs”. That is, we run a short run on Saturday, followed by a longer run on Sunday. We will do this every other weekend, increasing our distance until we can run 10K on Saturday, followed by 21.1K on Sunday. At that point, we’re off to California to challenge Dumbo. Now it’s your turn – go lace up your trainers and go for a run. I Dumbo Double Dare you!! This entry was posted in Training and tagged 10K, family fitness, Fun Run, Half marathon, kids running, run disney, Running on May 25, 2013 by RunningFamilyStyle. …and no finish line pictures because Gabrielle took off and her father spent 45 minutes searching for her. She ran with a friend, completed the race in just over 20 minutes, and managed to get herself to the pre-determined meeting place inside the Metro Center, but scared the pants off Mark in the process. Needless to say, a safety lecture followed! And then it was Sunday. It was 2 degrees Celsius when we got up, but it warmed up and turned into a beautiful day for a run. Mark, Kurt and David started out first, running the Half Marathon. They were followed by Lisa, Barb, Madison, Margaret and Madeline in the 10K. 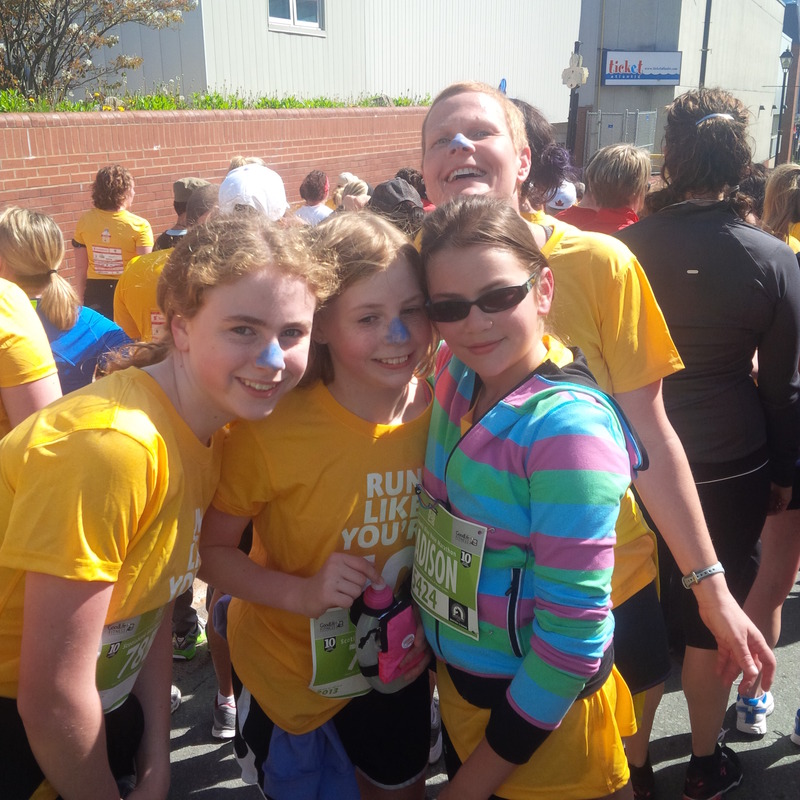 We’re proud of the girls – they were three of the 40 Under-15 Females to take on the 10K. We all crossed the finish line within our goal. Hooray!!! 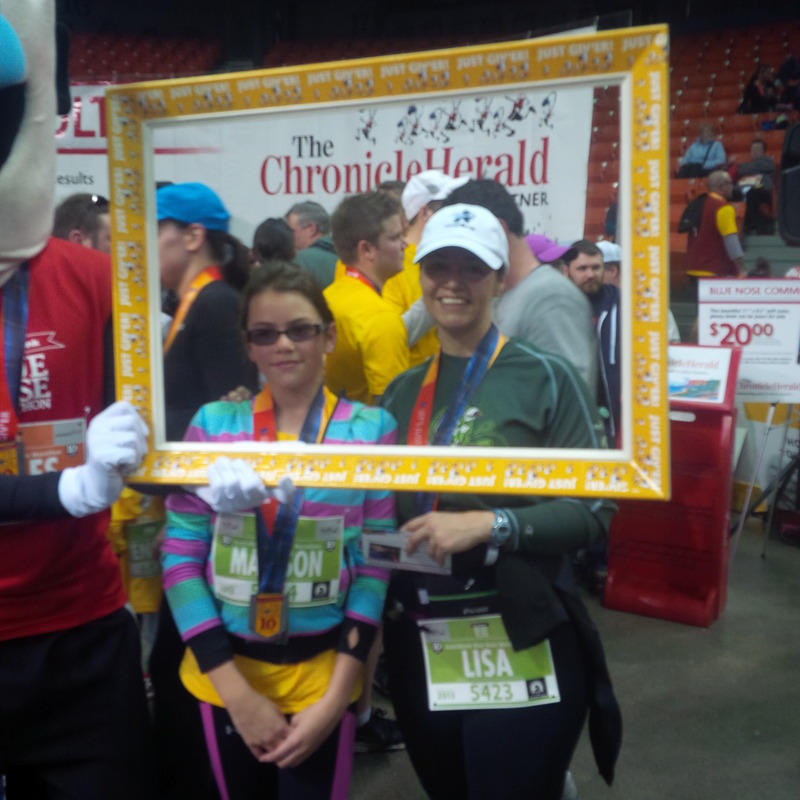 We’re super-proud of all the runners who took part in the Bluenose. And we love running family style!! 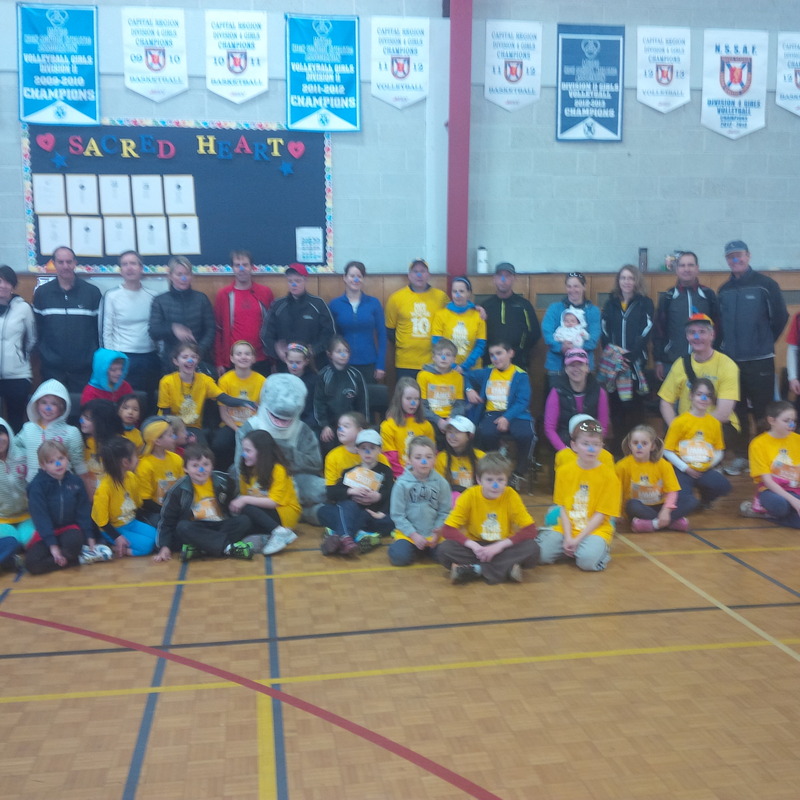 This entry was posted in Races and tagged Bluenose Marathon, family fitness, Half marathon, kids running, Running, Sacred Heart School of Halifax on May 21, 2013 by RunningFamilyStyle.